“This loveseat comes with a small footprint only measuring 67” width, but it doesn’t sacrifice comfort. If comfort is what you are looking for, look no further than our best overall pick, the Laurel Foundry Modern Farmhouse Roaslie Loveseat. This loveseat comes with a small footprint only measuring 67" width, but it doesn't sacrifice comfort. The deep backing makes it cozy enough to curl up and read a book in, but the look is formal enough if you entertain a lot. If you've got more space you can also pair it with the matching sofa for a complete set. Reviewers agree that this sofa is very comfortable and setting it up is easy. One even commented this a great buy for tall people since it has a taller back which can support you if needed. Paying an arm and a leg for a sofa isn't always realistic but you still want (and deserve!) something that is comfortable and pleasing to the eye. The Zinus Classic Upholstered sofa measures 71" in width so it's smaller than regularly sized sofas. What makes this pick is cool is that it can be assembled in less that 20 minutes and requires no tools, so even the least handy of people can put this together without any tears. Plus, it is shipped in one reasonably sized box and did we mention it is Prime eligible for shipping? 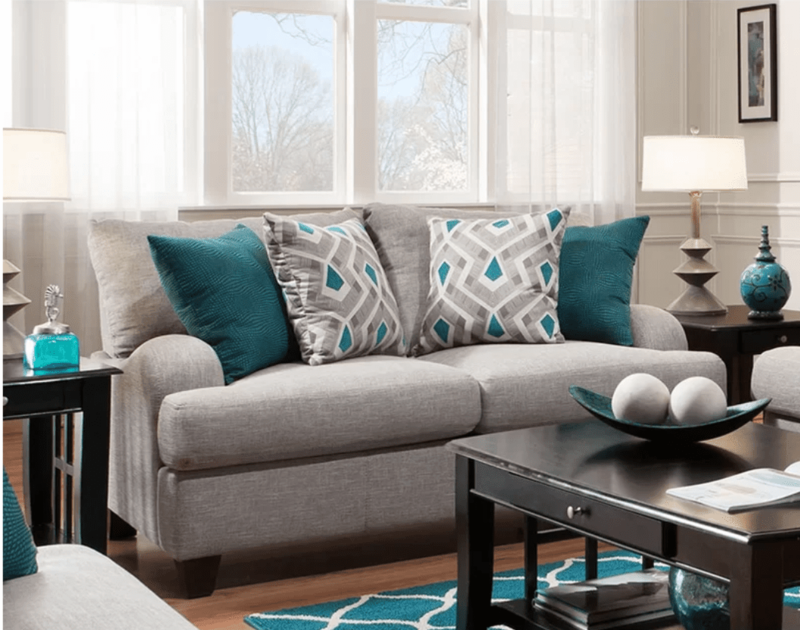 The sofa is made of a very durable and easy to clean fabric so you won't fret when spills happen. It has a wood frame which is wrapped in supportive foam cushioning to give you both a solid and comfortable couch to rest on. Though the Avery Sleeper Sofa is small, it creates the illusion of a larger couch with its split cushions and tufted back. The sofa is just 54” wide, making it a compact choice for even the smallest of spaces. The upholstery is made from 100% polyester and the frame is manufactured from hardwood. The sofa can comfortably fit one person lounging (or two small people) and pulls out into a twin bed. The mattress is certified memory foam, and owners say it is surprisingly comfortable for its low cost and small size. Owners love the Avery, but they do note that the sofa is on the firmer side. It comes ready to be assembled in three large pieces and reviewers note that it’s a quick and relatively painless process. Hunting for a small-space couch that's big on style? IKEA's FÄRLÖV loveseat measures just 70 1/8" wide, 41 3/4" deep and 24" high, so it's perfect for your cozy living space or den. Velvet couches are totally in right now, and the FÄRLÖV velvet cover is both luxurious and plush. It's available in either a yellow or deep gray velvet, or a beige or white cotton blend. Additionally, it offers a little under 6" of space beneath the couch, which any small space dweller will appreciate when hunting for extra hidden storage. We also love the low, rounded armrests and high back that allows for hours after hours of lounging comfort. Besides a loveseat, you can also get this as a sofa, sectional, armchair or ottoman so if space allows you can add more pieces. One reviewer notes that the couch is very deep, with plenty of room for custom throw pillows. Like most IKEA couches, the piece is firm but comfortable, providing a solid, crisp place to crash for that next Netflix binge. If you're coveting that "Mad Men" look, the Langley Street Isaac Sofa is sure to please. This modern sofa has bold, crisp lines, and though it has a narrow footprint, it packs a big punch. Overall, the Isaac is 58'' wide, 31'' deep and 29'' high, and is guaranteed to look terrific in any room. It has a solid wood frame with firm (but comfy) foam cushions. It comes in blue, gray or beige linen fabric, and features a tufted seat and back to give it a high-end feel. Finally, the medium wooden tapered legs really pull the mid-century modern look together. Wayfair reviewers rave about the look and design of the Isaac sofa, with one owner saying it should "cost three times the price." Though you'll have to assemble it upon delivery, owners say it's simple and easy, especially if you have an extra hand. Plus, the price is a steal! If you thought a sectional could never work in a small space, think again. The VALLENTUNA sectional is everything we love about sectionals in a small package. This Ikea piece is incredibly customizable, allowing you to design your own couch to fit your specific needs. The best part? You can even add more pieces to it when you move to a bigger space. The two-piece sectional is 76" x 76" x 33 ⅛”, perfect for a small, cozy corner of your living room. The frame is made from solid wood, plywood and particleboard, and the cushions are a mix of cotton, polyester, rayon and linen. Ikea furniture is created with active families in mine and is very easy to spot-clean or toss the cushion cover in a washing machine. As with all Ikea furniture, the VALLENTUNA includes a 10-year limited warranty. It comes unassembled, but if the idea of putting Ikea furniture together feels daunting, many companies will do it for you for a fee. The Drake Sofa from West Elm is a high-end piece that looks stunning in any small space. It measures 76” long, which is perfect for a cozy living space or even a den. Its solid wood tapered legs give it a mid-century modern feel, and the tufting looks classic and chic. The biggest draw of the Drake Sofa is that you can customize it to your taste. You can choose from a variety of colors and fabrics, including polyester weave, velvet and microfiber to create a one-of-a-kind couch that works for you. Do note that some colors and fabrics are custom orders and thus non-refundable, but you won’t want to part with this gorgeous sofa anyway. Though the delivery cost is a bit high, you’ll get the Drake Sofa delivered right to your door, no assembly needed. If you’re looking for an attractive modern sofa you can match specifically to your home, the Drake is a wonderful choice.